I just can’t help it. Puns, they are an addiction. I didn’t even set out to make a punny card; I just set out to make a card for the TGIF Challenge this week. Honest. 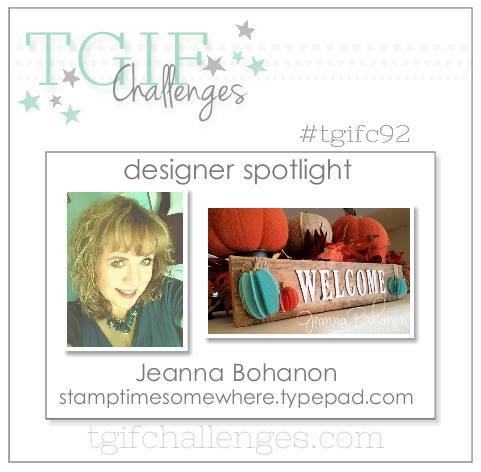 The challenge this week is to be inspired by Jeanna Bohanon — no problem! Everything she makes is fantastic and inspiring — seriously. I’m totally not kissing up or anything. I’ve followed Jeanna since her years on the Artisan Design Team and love to see her creations. Gorgeous. I decided to use her technique of clear embossing on black cardstock and her layout. I had an idea that I might want to emboss these bees, but I checked through all my stamp sets first. This card almost ended up with fox heads instead. I chose So Saffron for my card base — you cold totally take it in another direction, though. Emerald Envy or Bermuda Bay or Mint Macaron would be fun, too. 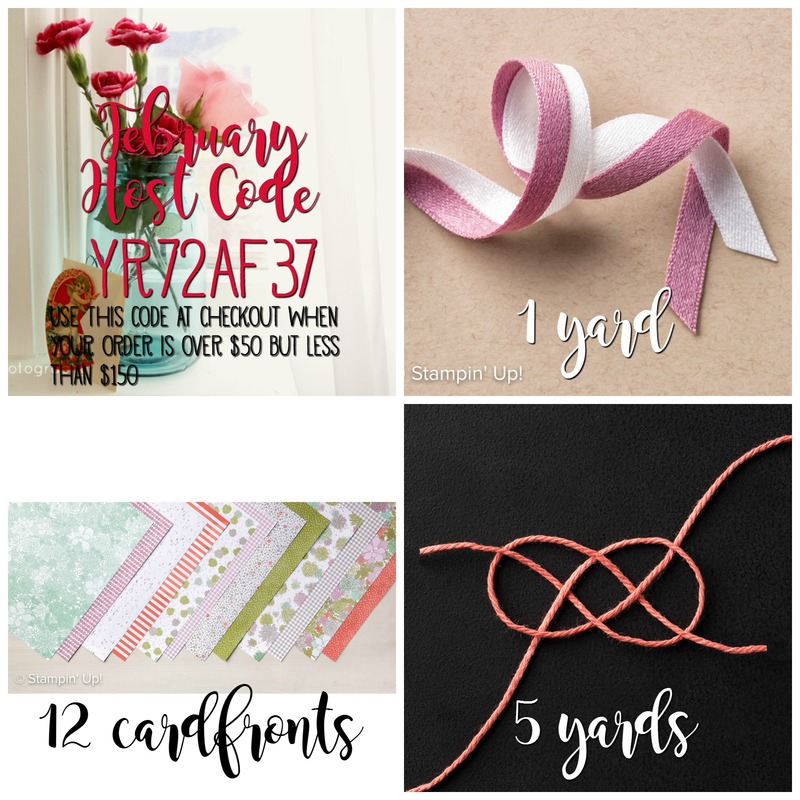 Or use a red or pink and add the sentiment “Bee My Valentine” with the Labeler Alphabet. The card base is 4.25″ x 11″, scored and folded at 5.5″. The Basic Black cardstock panel is 4-1/8″ x 5-3/8″. I started by rubbing the panel all over with the Embossing Buddy. This keeps the embossing powder from sticking in random spots on the cardstock. Then I stamped bees all over the panel with Versamark ink. 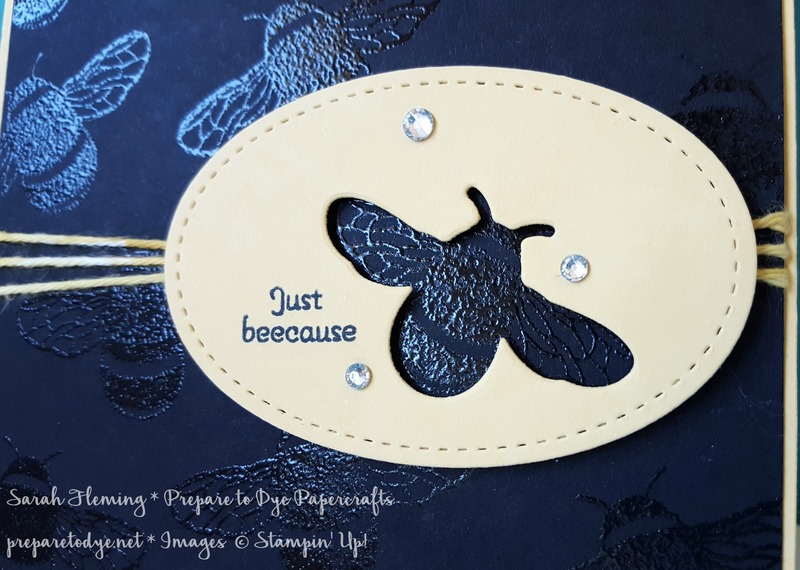 I had an idea where I wanted my stitched oval to go, so I chose the position for the bee that’s embossed directly under the negative die cut first. I stamped it first, then filled in the bees all over the panel. I sprinkled on, then shook off, Clear Stampin’ Emboss powder. Melted the embossing powder until it got all shiny. What a WOW factor! I think I’ll do this a lot more often. I cut out the oval using the Stitched Shapes Framelits. Then I laid the bee thinlit on top of the bee that I’d stamped first, the one right under the oval. I laid the oval on top of the die, straightened it to the position I wanted, then mashed down on the oval and pressed all around the bee thinlit until I had a very light impression of the die on my oval. Then I took it to the Big Shot and positioned the thinlit on top of the oval, right over the impression I’d made, and cut out the bee. 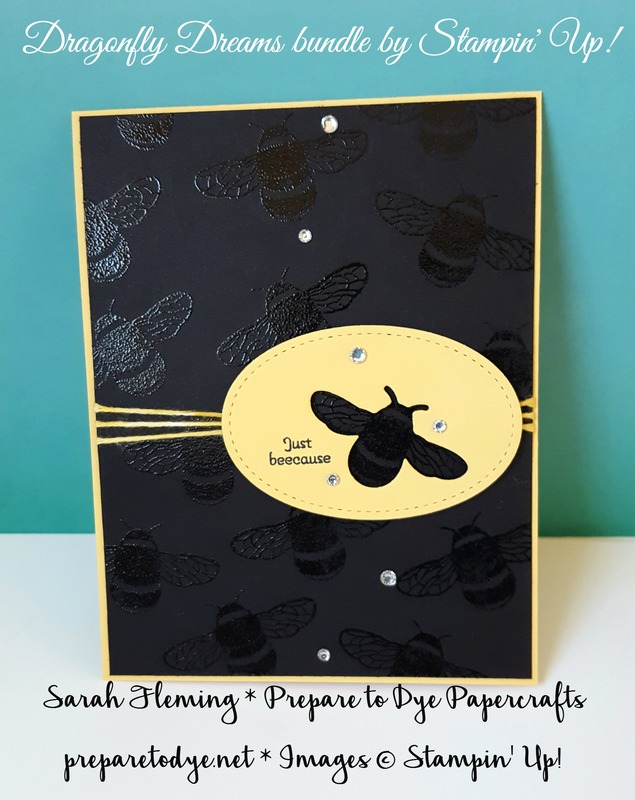 I was surprised that the negative lined up so well with the embossed bee! I mean, in theory it should work, but I wasn’t sure it actually would. I stamped the sentiment before adding Dimensionals to the back of the oval. The twine is Whisper White Solid Baker’s Twine. I painted on some So Saffron ink with my Aqua Painter. This time I put a few drops of ink from the reinker on a Clear Block and picked up the color from there. I glue-dotted the twine to the black panel under where the oval would be, wrapped it around behind the panel, and glue-dotted it down under the other side of the oval. I added the oval to the card with Dimensionals. Next I glued down the black panel to the card base, then added the rhinestones. I’m still amazed by how much adding a few inexpensive rhinestones steps up a card. 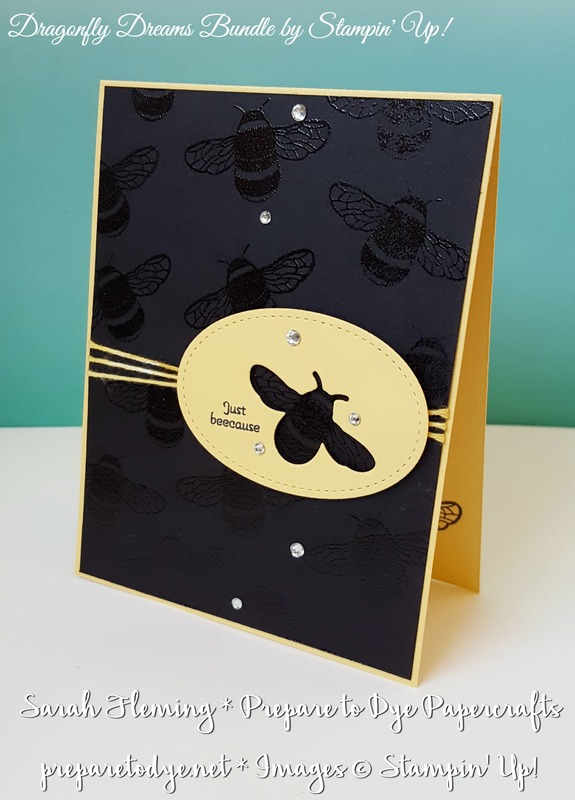 Finally, I stamped a fuzzy bee on the inside of the card. I hope you like my card. Jump over to the challenge and see all the great cards the design team put together! Sarah, thank you so much for the kind words! I totally appreciate the love. Your card?!?!?! Yeah, I’d say you totally nailed it too! Brilliant how one of the bees shows through. Thank you so much again, and for following and playing along with us at #TGIFChallenges! 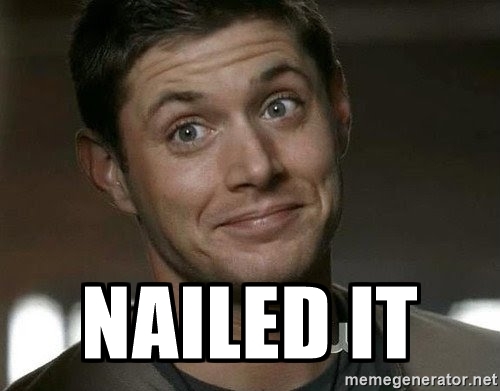 I totally enjoyed your post but obviously your “nailed it meme”. Just plain awesome. Thanks for playing along at TGIF! 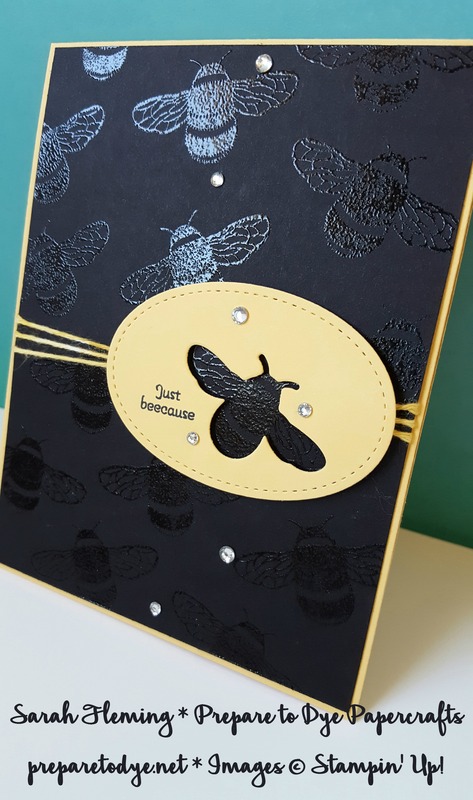 I love your embossed bees! This card is simply stunning! Thanks for joining us at TGIF!! Thank y’all so much for your lovely comments! Hi Sarah! 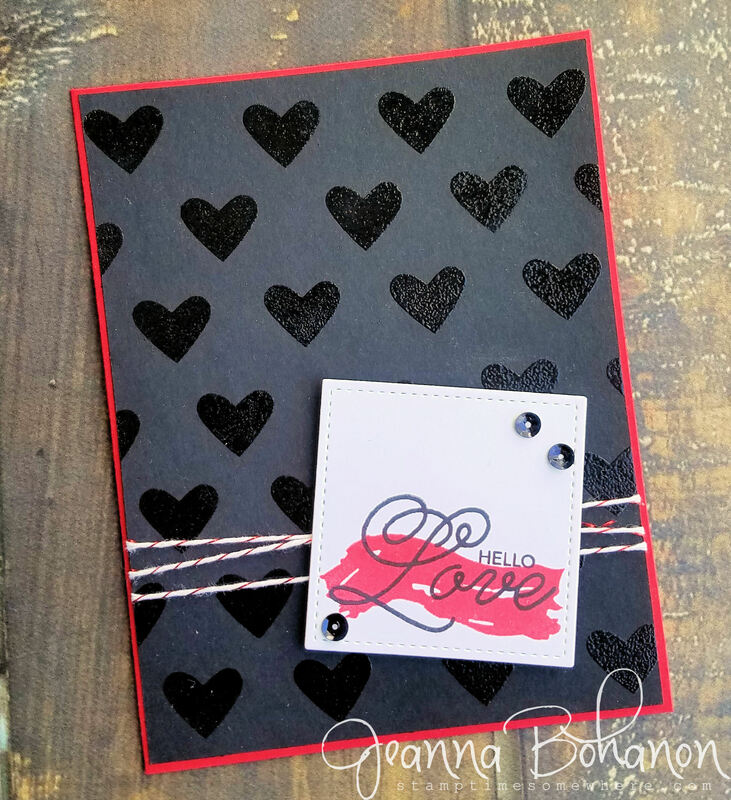 I love your take on Jeanna’s card! I too need to emboss with clear powder on black cardstock sometime! Congrats on being chosen as the challenge winner over at TGIF this week!